SEFT is a nonprofit, 501c3, organization committed to providing grants to educators to expand educational opportunities at all grade levels in the Sutton Public Schools. 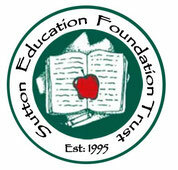 Please make the check payable to Sutton Education Foundation Trust or SEFT. If you want to make your donation quickly, you can use the Paypal button below, but your donation goes a longer way with a check. Thank you.